Made of natural rock quartz with titanium coated, every stone is unique and you will not be receiving the exact stones in the pictures.Normally,you will receive 1/2 lb(about 9-12 pieces)stoens. But the exact quanity depends on the size and weight of each stone. These raw stones are captivating and can be used for arts,crafts,home decor,decoration,tumbling,gem mining,fountains,wire wrapping,jewelry making, reiki and more. Stone Size: approx 0.7-2.2 inch length, 0.6-1.18 inch wide, 0.35-1 inch thickness; Natural rough stones, undrilled and unpolished; As each stone is unique, so they will vary in size,color,shape and patterning, and you will receive ones similar to the image shown. Quantity: 1/2 lb(about 230 gram, between 9-12 pieces per pack), comes with a velvet pouch, it's also ideal for a gift. Titanium coated natural rock crystal with colorful color that is produced from titanium. Titanium is one of the strongest,lightest and most beautiful of all metals, it balances all the chakras and opens to a deep state of meditation. Quartz is the living embodiment of power. It is the most powerful crystal among all for its supernatural abilities related to healing, living memory, spiritual guidance, spiritual power, connections to all paranormal forces, and ability to project and interact within all the Realms. 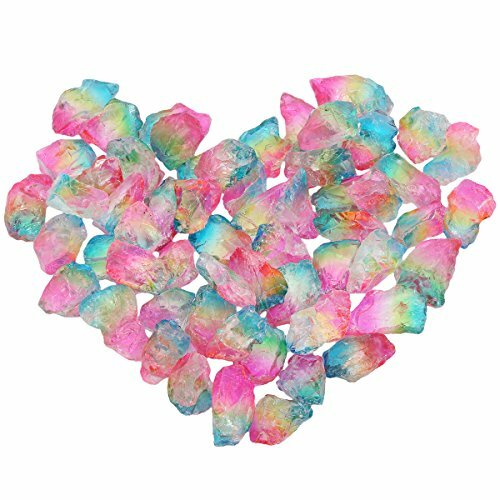 These raw crystal can be used in jewelry making(cabbing, wire wrapping, etc), chakra balancing & other spiritual purposes(crystal healing), collected as stone specimens, home or garden display & decoration(feng shui), rock tumbling and more. If you have any questions about this product by mookaitedecor, contact us by completing and submitting the form below. If you are looking for a specif part number, please include it with your message.